THIS AFTERNOON, my husband, son and I returned from a weekend trip to my beloved prairie, southwestern Minnesota. The journey brought stops along the way and back—one which stretched into a 2-hour lunch at The Dam Store, a food/live bait/tackle place just outside Rapidan near Mankato. This homey joint, which sits next to the Rapidan Dam on the scenic Blue Earth River, advertises the “BEST DAM HAMBURGERS AND PIE BY A DAM SITE.” That’s no lie. But you won’t read about it here. I’m planning a magazine feature story on this kitschy 100-year-old café/store. That explains the lengthy lunch hour (or rather two), of a cheeseburger and fries and dam good homemade chocolate caramel pecan pie, that evolved into interviews and photo-taking. 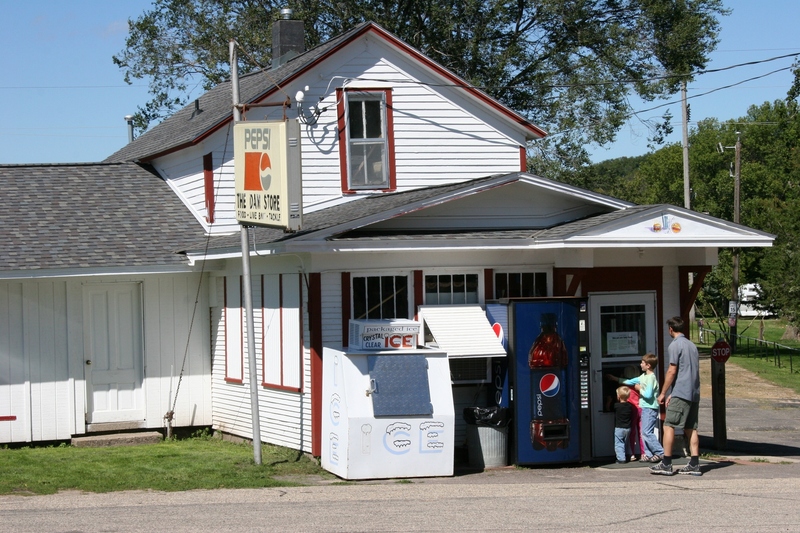 You'll find great hamburgers and homemade pies at The Dam Store, an unassuming century old eatery. As we traveled west toward our destination in rural Lamberton in Redwood County, I filled my camera with images from the road, setting a fast shutter speed and zooming down the passenger-side car window or aiming through the windshield whenever a photo op arose. All along that drive, I gawked at the sky, the wide, wide prairie sky that I can never get enough of no matter how many times I view it. Likewise, I cannot get enough of this land where I grew up. Here the soil and sky and wind taught me how to see and smell and feel and listen, and because of that, how to write with a detailed, grassroots style. Returning to southwestern Minnesota renews my gratefulness for roots that reach deep into the earth. Even though I left this land 36 years ago, I remain forever connected to the prairie, “home” in my heart. 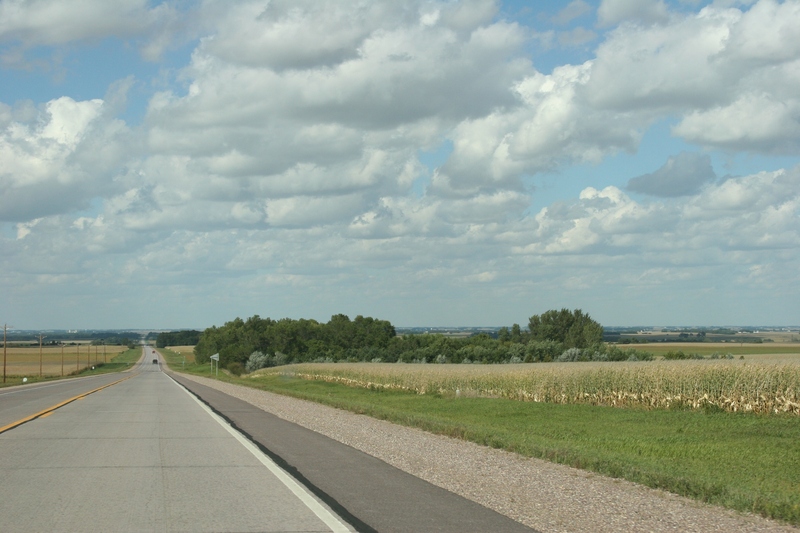 Driving U.S. Highway 71 in southwestern Minnesota, you can see a sky and land that stretches beyond forever. 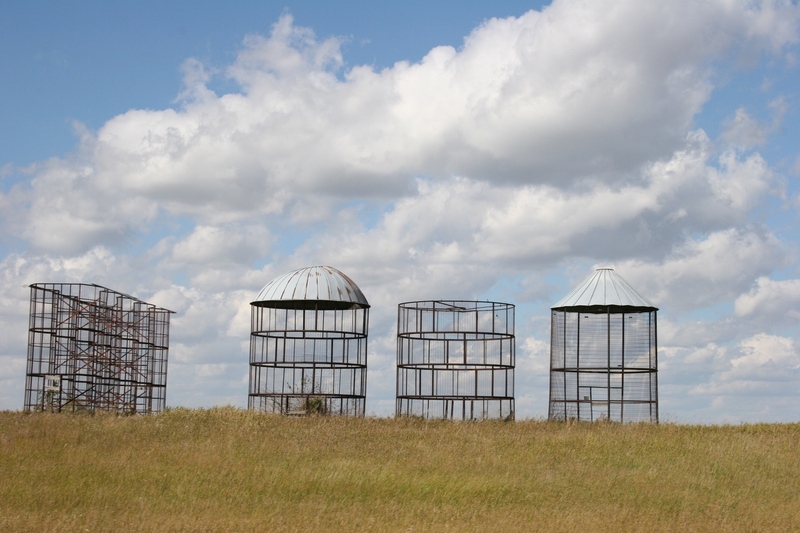 Empty corn cribs on the prairie await another harvest. Or perhaps they are no longer used. 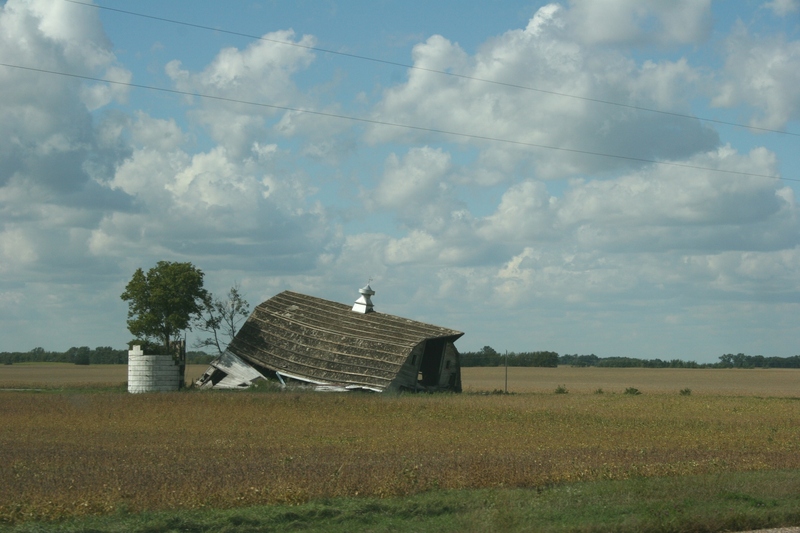 Even a collapsed barn possesses a certain beauty on the prairie. While I saw many barns in disrepair or falling apart, I also saw many that still stand, strong and proud in this wind-swept land. 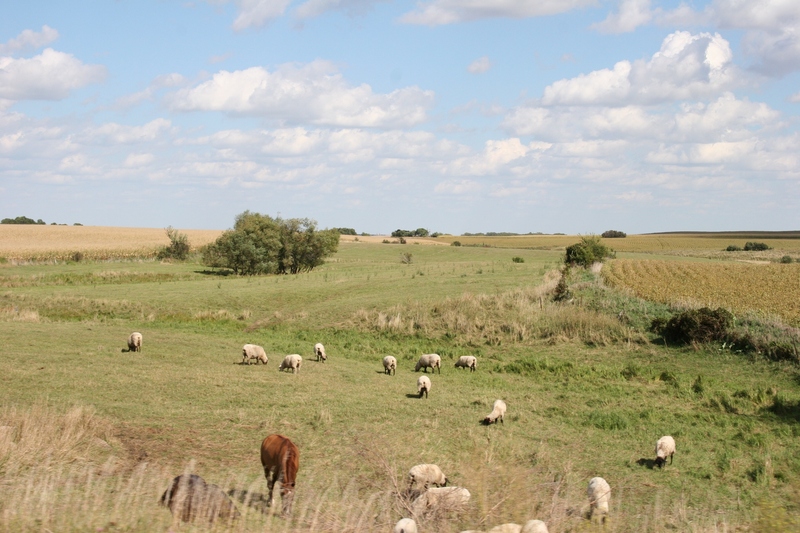 Sheep and a horse graze in a roadside pasture. 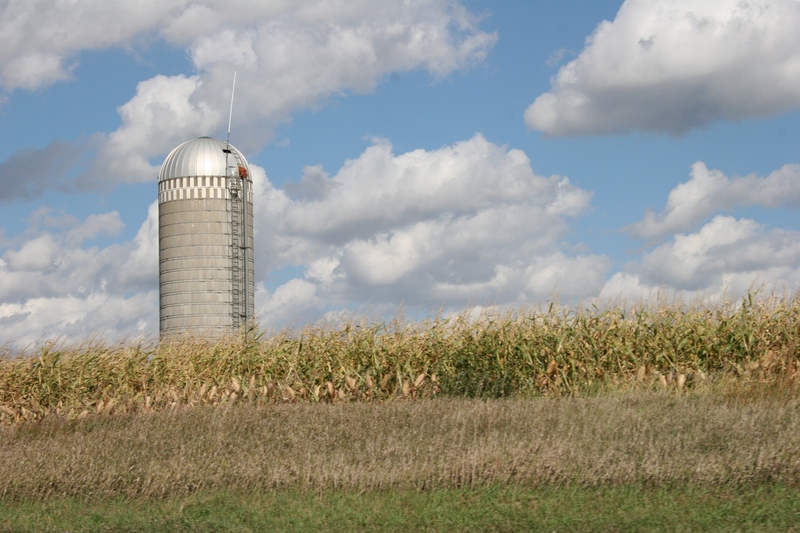 A lone silo leaves me wondering, "What happened to the barn?" UPON OUR RETURN to southeastern Minnesota, I grabbed today’s Faribault Daily News from the mailbox to find my photo, and a feature story about me, splashed across the front page. Several days ago reporter James Warden interviewed me about my blogging. I’ll be honest and tell you that I’d been dodging the interview with James because I’m a bit uncomfortable in the spotlight. I much prefer the other side of the notebook and camera. Even though I would have preferred my story tucked discreetly inside the pages of the newspaper, I cannot contain my enthusiasm for James’ reporting and writing. He captured the essence of me and my blogging style by using words and descriptions and details that would be fitting of a Minnesota Prairie Roots blog post. If you’d like to check out journalist James’ take on me and my blogging, click here.